This post is written by Dave Lutz. I’m a believer in Hybrid Events and the benefits of extending reach through that strategy. Associations that go down the hybrid road, and make it financially attractive, are putting their profession ahead of profit. AND they will reap long-term benefits. For the past year or more, I’ve been saying that virtual events won’t cannibalize your live ones. I believe that with the hybrid models. Recently I realized that the lowering cost of streaming and hosting has enabled new competition for thought leadership and quality content. Some associations are beginning to feel the competitive pressure from unlikely sources like: publications without events, their best exhibitors or self-organized communities. 1. Slides synced to audio are not immersive. After you attend a digital event with video, slides and live chat there’s no comparison. Sure it will work for on demand CEU delivery but not for the live experience. There’s something motivating and compelling about a digital event that integrates live chat. 2. Virtual events are not a numbers game. If you want to deliver value, you need to shoot with an arrow and plan content that attracts a very specific vertical segment. If you plan content and market to a general horizontal audience, you won’t deliver sufficient value to the participants or sponsors (unless you are delivering content that is just-in-time). Using virtual tech to be first to market on a critical issue is a smart practice of real market leaders. 3. Lower expectations of sponsors or exhibitors. The cost per lead of a virtual business card is, in my estimation, worth about 25 cents on the dollar of a lead from a live event. Virtual leads are good for list building and in my opinion rarely result in sales ready opportunities. Your no show rate might be high for virtual events. You need to think twice about selling the names of the no shows to your sponsors. 4. Free allows marketing. Paid blocks it. Most mobile apps and online subscription models have adopted this pricing model. Think about ways you can apply it to your virtual offerings. Maybe members attend free, non-members pay. 5. View virtual events as campaigns not products. Use virtual events to promote your physical events or to attract and engage less-active or next generation members. If you embark down the virtual road as a money making vs. value creation endeavor, you will likely be disappointed. Sure you’ll be able to partially or fully fund through sponsorships but the virtual decision is one that maps to your mission and mission only. 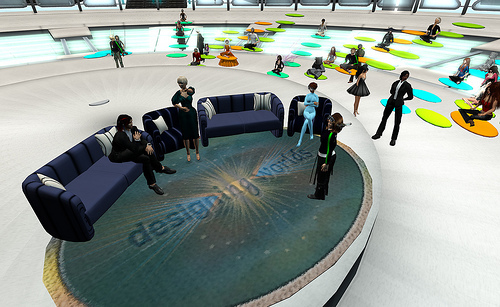 Virtual event business models and value propositions are evolving fast. When crafting your strategy, always look to your organizations mission and strategy. Often those include educating or advocating for your profession. I predict that organizations that take a gamble and deliver value with a digital event strategy will be rewarded with loyalty, retention and future purchases. This article was adapted and written by Dave Lutz for Dave’s People & Processes column in PCMA’s January edition of Convene. It is reprinted with permission of Convene, the magazine of the Professional Convention Management Association. © 2011. What do you think is the future of pure virtual events? Interesting points. At moreconference.com we think we have a new take on the hybrid model: a social netowrk that’s only available to delegates and other invited people. It leads to a much higher quality online conversation, supporting the real conversation that’s taking place face-to-face. Check it out! The major issue I have regards the actual metrics used for “engagement”. Engagement is such a subjective term. It’s difficult to say that because you had 95% of your registrants logged in for 8 hours straight and that they gave a 4 out of 5 rating on the post-event survey you had an engaged audience. What percentage of your audience participated in the online conversation. Did you create games or activities that fostered engagement and provided a measurable engagement success rate? THOSE are the types of creativity just not seen yet. Thanks Jeff, for keeping us on our toes. LOVE your second point! Virtual Events are not a Numbers Game. I couldn’t agree more. A narrow focus and a specific message is most valuable. More importantly, a narrow focus allows your attendees to have a more meaningful experience if you can make the virtual event a little interactive. We run what we call Virtual Study Groups for exactly this purpose. They tend to be small and very meaningful virtual events! A little homework to get everyone on the same page, a forum to begin the discussion and a classroom/webinar experience to wrap it up. Then we usually bake that into a 3-6 week series to make it even better… It’s all based around your premise in point 2! @Francis Thanks for adding the social community point. So far my experience is that event based communities tend to have very low adoption. How are you tackling that for major association or tradeshow events? @Midori Great point about engagement! I think the tech platforms will address this with both tools and best practices, but also think that it’s going to be an uphill climb for events that take a horizontal approach to their content strategy. Engagement needs to lead to improved connections and it’s really hard to mine that gold in a buffet style virtual offering. @Dave Love the virtual study group concept. Are you using a skype like solution to make the small group discussions more immersive? Looking forward to seeing you next week! @Jeff – Nope the discussion will be the old fashioned method of talking… We use Operator Assisted Calls in our Virtual Study Groups so we have complete control over the teleconference. VOIP would complicate things too much at this point in the game, so we’re using the old reliable telephone to accompany the web conference. I’m a marketer who is new to this site and find the content practical and insightful. I’m wondering if there is any data out there on companies in the B2B space that are having great success with virtual events? Which industries are leading the charge with the integration of virtual events into their marketing mix? 1) Virtual Edge Institute – http://www.virtualedge.org/ Check out their resources and news tab. 2) It’s all Virtual blog from Dennis Shiao of InXpo. http://allvirtual.wordpress.com/ He pounds out exceptional posts a couple times a week. 3) There are a few virtual event groups on LinkedIn that provide great discussions. The book is still being written, so keeping your ear to the ground is important for pulling the right triggers. Good luck! I think this is the year that we will see virtual events (webinars) finally move to be a more engaging method of knowledge sharing. You mentioned “most webinars stink” … I agree to a certain extent. It is changing. Webinar Production companies are focusing more on working with presenters to seize the opportunity for meaningful interaction before, during and after the live program. With a move to openness and an agenda that encourages participation, the distance can be overcome. Dave W’s example is an excellent way to create a positive learning experience. @rich thanks for your comment. Would love to hear more about Webinar Production Companies are coaching for increased participation. No question that when you accomplish this, greater value is received. I am not an expert on the topic of virtual events but I did participate in a couple of tweet seminars, but they were of a political nature. I didn’t know the same process was used in business.